Thermal modeling can be particularly challenging because setting up your thermal simulation can be different every time. Meanwhile, you seek to balance competing priorities within your design. "It should be lightweight! Durable! Affordable!" the list of hopeful attributes is extensive so some compromise will have to occur. You can better decide where those accommodations can be made with an accurate thermal model. Even though each problem you may face has its unique challenges, you will ask yourself some standard questions every time you go to set up your model. If you are cognizant of these issues, you can save time and create an effective model. So what questions should you be asking yourself? 1. How accurate of a thermal model do I need? Level 1: This type of model can show you directional change. If you make a design change, you can expect to see the temperature increase or decrease. Level 2: This type of model will show A/B comparisons and will demonstrate a quantitative amount of change (i.e., the temperature changes 5 degrees). Level 3: Can give you an absolute answer, delivering simulation results that can be replicated in your physical set up. If you already know the problem you are facing, a directional model may be all that you need to confirm a design change. If you need to know how big of a design change to make, you may want to have a thermal model that can compare a few iterations. Taking the time to model a Level 3 thermal simulation is only necessary when you are completing a comprehensive model for a new design. This type of simulation will allow you to get real answers from your model, making your prototyping and testing phases more predictable. To learn more about our thermal modeling software, TAITherm, check out our eBook here. Once you know what kind of solution you are looking for, you can model the appropriate level of detail. 2. What are my areas of interest? When setting up your thermal model, consider your areas of interest. For these areas, you will want to include the primary heat sources, heat sinks and heat transfer paths that you expect to occur in the system. For a vehicle where the underbody is your area of interest, the primary heat sources are the engine, radiator, and exhaust system. The primary heat sink would be the cool, ambient air moving past the vehicle and your expected heat transfer paths might be radiation heat from the exhaust system, convection heating or cooling from the underhood air, convection cooling from the fresh ambient air, conduction through mounting points, and radiation to/from the road. 3. What geometry should I include? Everything is predicated on what problem you are trying to solve. But generally speaking, you will want to include anything that creates or blocks a heat transfer path. You can choose whether or not to include peripheral components. 4. How detailed should my geometry be? How coarse or fine to make your mesh could influence your results. The more complex your geometry is, the longer it will take to run the simulation. The simpler your geometry, there will be less to set up and mesh, and fewer computing resources will be necessary. When running a long, transient model where many time steps will be computed, it is worth spending time to simplify the geometry and reduce the element count so that less time will be spent on computation. But, if the main goal is a steady-state or short transient model that will run relatively quickly, it will not be worth the extra effort to simplify the geometry and the model can be run with a larger number of elements. 5. What component properties do I need to include? How detailed these properties need to be, depends on what you are trying to model and how accurate you want to be. You may be able to get away with some assumptions if you are looking to confirm a design change or compare two designs, but if you are hoping to come away with a Level 3 simulation, you will want to be as spot-on as possible. 6. How should I set-up my heat sources? Heat sources can be applied using imposed heat rates and fluxes or by assigning temperatures. The best way to apply your heat sources depends on 1) what information is known and 2) what simplification was made in the model. To give an example, let’s look at modeling the engine block. An estimate of how much waste heat is produced by the engine can be made based on expected engine efficiency. You could model the engine using an imposed heat. However, it can be difficult to know how much of the engine waste heat dissipation is divided between the cooling water, the exhaust gas, and heat transfer at the surface. In such a case, it is easier to assign expected temperatures to those parts. 7. Should I run a steady-state or transient simulation? 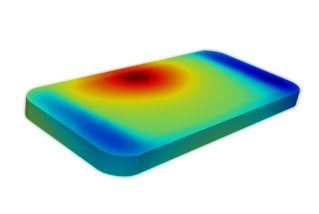 You will want to consider whether running a steady-state or transient simulation is the most effective for your thermal problem. Some scenarios can be adequately approximated as steady state such as steady highway cruises or long, steady hill climbs. But, other conditions must be modeled transiently such as an engine-off hot soak or a cabin heat up or cool down scenario. Some extreme boundary conditions experienced by a vehicle only last for a short time, such as a diesel particulate filter (DPF) active regeneration. In this scenario, the filter surface temperature is very hot and radiates to the surrounding components. If a steady-state analysis is done using the peak DPF heat rates or assigned surface temperatures and a boundary condition, the temperatures of interest will be over predicted. While such worst-case simulations can help produce robust and safe designs, they can be unnecessarily heavy and expensive since they were designed based on an unrealistic worst-case scenario. 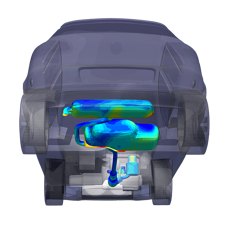 Running a transient simulation will allow designers to accurately predict the true use cases and peak temperatures to best optimize the vehicle for both cost and durability. 8. In what kind of environment will my simulation take place? Sometimes you will work within a bounding box environment with a constant temperature. However, you may want to know how your product will fair in the real world. Adding natural weather or environmental effects like solar loading, ambient temperature, etc. can affect how your product’s thermal capabilities perform. Knowing the answers to these questions will set you up for a more successful simulation. It is still complicated, but that's why we as an industry are always looking to create better processes. Understanding what inputs you need to collect and the level of detail you need to model them can help you create your most efficient, accurate model. For challenges you don't want to take on alone, we offer engineering support for your projects. Our thermal experts understand these challenges well and can help you solve them. They can also help you create a process you can own if you have an existing or developing thermal team. We also offer introductory and advanced training for all our software. Keep an eye on our events page for general training or contact us to set up a training session tailored to what topics you want to learn.